As previously reported, Dwayne "The Rock" Johnson will soon join DJ Zac Efron for the "big, fun, and Rated R" cinematic adaptation of the esteemed literary classic Baywatch. On Monday, The Rock inadvertently offered a sneak preview of his Baywatch qualifications by playing fully dressed lifeguard to two adorable puppies. 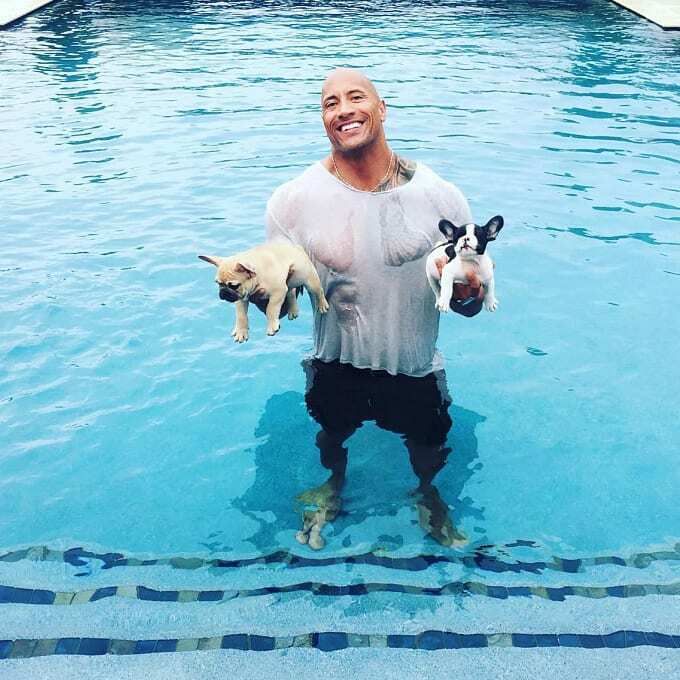 Sharing the rescue operation on the &apos;gram, The Rock reveals that the two baby French bulldogs (Brutus in his right hand, Hobbs in his left) were only recently added to the Johnson family. "[I] bring them home and immediately take them outside so they can start learning how to &apos;handle their business and potty like big boys,&apos;" writes The Rock. "I set them both down and they both take off in a full sprint and fall right into the deep end of our pool. HOBBS immediately starts doggy paddling while BRUTUS (like a brick) sink[s] heads first to the bottom of the pool." The Rock then broke into a full sprint, jumped in the pool, swam to the bottom to save Brutus, grabbed Hobbs, and then realized he had his phone in his pocket the entire time. "While spiriting to save your puppy&apos;s life, before you dive in, try and throw your cell phone to safety," The Rock advises. "Don&apos;t keep it in your pocket like I did."